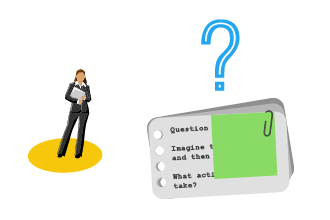 In the PARTICIPOLOGY question resource bank you will find some pre-set questions which you can use as they are, or adapt them to suit your particular situation and locality. Instead, you might wish to design you own questions. Here are some general rules and insights for designing good questions. Keep it simple and use plain English. The question should not be so long that it is difficult to assimilate all the information. The question should only have one question in it; beware of making multiple demands. The question should be jargon-free and be designed with the target audience in mind. The question should prompt reflection and provoke discussion around the implications of proposed options, i.e. a deeper thought, rather than a 'knee-jerk', superficial response. Referring to visual information on the board might be really helpful here. The question should be realistic and preferably stem from issues identified as important from previous experience/evidence, rather than simply made up. The questions should be pilot tested before they are used in any public setting. Any difficulties with language, ambiguity and misunderstandings should be carefully recorded and the question improved accordingly. The question should be part of a set of questions for your exercise. Look at the cumulative impact of the range of questions in line with your specific aims and goals. Ensure that you review the success of your questions and send us a case study template, critically reflecting on your questions and RUFkit experiences.